The most powerful law enforcement agency in Britain is in crisis. 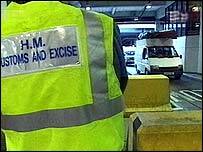 Her Majesty's Customs and Excise (HMCE) is under investigation by the Metropolitan police. How did the agency, whose investigators were once regarded as the gold standard of criminal justice in Britain, fall so spectacularly from grace? Hundreds of millions of pounds have been squandered in lost revenue. Two of Custom's most senior personnel - its head of law enforcement and Chief Solicitor - were suspended last year, and the department has lost control of its powers to prosecute. NOTE: A complaint about this programme has been upheld by the BBC Editorial Complaints Unit. Mr Terry Byrne successfully complained to the BBC about aspects of the way he was represented in this programme. Please use the following link to read the adjudication of his complaint. Panorama reveals the story of "The Swerve", a simple criminal sting which resulted in one of the most disastrous anti-fraud operations ever embarked upon by HMCE. The operation, at the London City Bond warehouse, led to 109 defendants walking free after Customs officers were found to have misled judges in secret hearings and lied in court. One former senior Customs solicitor, Gordon Smith, breaks rank to speak exclusively to Panorama about his role in the affair. "It seems such a tragedy that such an organisation as old as HM Customs and Excise should die the death that it has done because of the incompetence and because of the lack of back bone of the people at the top." One of the fraudsters involved in "The Swerve", John Early, a South London haulier, also speaks candidly to Panorama about the millions he helped divert in alcohol duty and how Customs allowed it to happen. "They left the door open didn't they? And everybody came in and kicked it off the hinges. It was all a giggle. From day one it was a giggle." But, as Her Majesty's Customs and Excise strives to reinvent itself in a merger with the Inland Revenue, Panorama asks whether the country's oldest and most powerful law enforcement agency is still unable to rid itself of a culture of excessive secrecy.